The Hotel Edelweiss & Gurgl is the best hotel in resort. The hotel is beautiful, the staff are very friendly and the location is perfect. It is ski in – ski out and the main après bar (Nederhutte) is right outside allowing you to ski back home straight to the door. If anyone was to go to this resort it is without a doubt the best place to stay. The rooms are spacious and furnished to a really high standard. There is lots of space in the lounge to relax and have a drink by the fire before dinner and the food is delicious. It’s a great hotel for families and for groups, and the atmosphere is always warm & friendly. 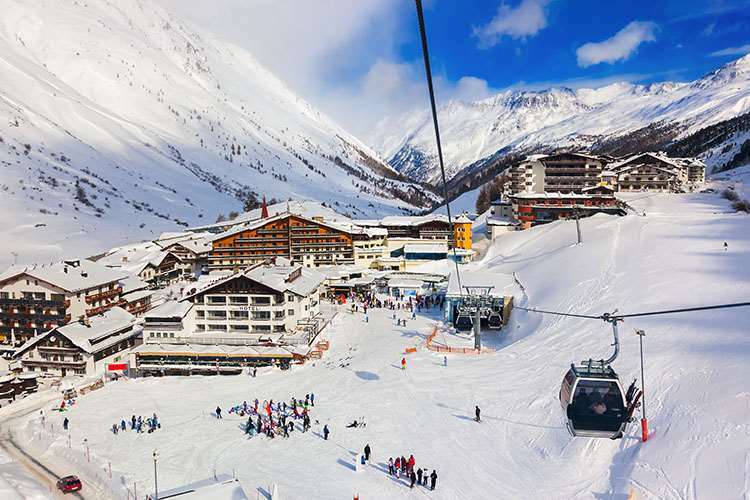 The Edelweiss & Gurgl is one of Obergurgl's leading hotels and is a great traditional favourite with guests who return annually. Owned by our good friends the Scheiber family, the Edelweiss offers high standards of cuisine and service as well as skiing to and from the door. With its perfect location next to the lifts and a ski & boot room leading directly onto the slopes as well as an extensive leisure area, all your needs are well catered for here. 130 Standard Austrian twins have bath or shower, those with south-facing balcony have bath or shower, those with south-facing balcony are smaller. Larger, superior rooms sleep up to 3 and have bath, separate WC and are north-facing, some with balcony. Superior rooms with south-facing balcony are slightly smaller and still sleep up to 3. Two-room suites sleeping 3-4 have separate bedroom, lounge area and north-facing balcony. Single rooms have bath or shower and south-facing balcony. All rooms have flat screen digital TV, radio, telephone, safe, bathrobes, slippers and hairdryer. Just returned today (01/02/14) from 7 days holiday. The hotel was very good, both for accommodation and food and the ease of skiing. Would visit again provided I did not have to travel on Monarch Airlines as their commitment to customers does seem questionable. A quality holiday experience, apart from the airline. My good marks below are for the hotel and facilities. The location of the hotel is the biggest attraction which is why we have been coming here for the last 7 years. It's right next to the main lifts and the ski shop is underneath the hotel and next to the boot room so no effort required at all. The staff are excellent and very friendly, particularly in the restaurant where they also serve superb food. The ski shop feels like an integral part of the hotel and the staff there are very relaxed about damage to skis and the gear is always new. Prices are high but then where isn't in a skiing resort? Buy drinks in the supermarket next door and drink them in your room if you want to save money. My only criticisms are that the hotel can be very hot at times, they allow smoking in the bar which I dislike, the rooms are not overly luxurious (but I don't come skiing to stay in the room). We have in the past found that organisation of rooms for groups challenges them. Even if you email in advance, it doesn't seem to make any difference so you have to assert yourself on the day to get what you want. Overall, with the excellent Obergurgl snow record, it takes some beating.